General Motors salutes Detroit Tigers Miguel Cabrera for winning the AL Triple Crown on their Renaissance Center headquarters. 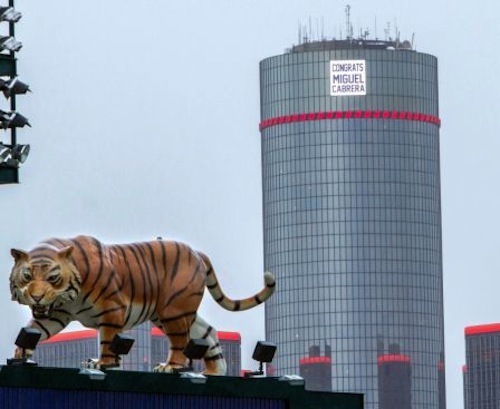 General Motors pays tribute to Detroit Tigers third baseman Miguel Cabrera for winning the American League Triple Crown by putting a sign atop its Renaissance Center headquarters this weekend. Cabrera won the AL Triple Crown on Friday, October 5, 2012 in Detroit, Michigan. GM added three panels to its rotating LED sign atop its Renaissance Center headquarters this weekend to pay tribute to the AL slugger. The Detroit Tigers are playing the Oakland A's in the AL Division Series at Comerica Park this weekend. The ballpark is just a baseballs throw away from GM’s Renaissance Center headquarters and the huge sign can be seen by fans entering the ballpark. Cabrera is the first player from either league in 45 years to have led the league in batting average (.330), runs batted in (139) and home runs (44). Cabrera also had the highest slugging percentage (.606) with the highest OPS (.999) in the majors this year. Cabrera sealed getting the Triple Crown by out-hitting Mike Trout .344, 19 HR, 54 RBI to .287/12/28 since Aug. 1. It’s a big deal for the Tigers and the city of Detroit because the Triple Crown was last accomplished by Hall of Famer Carl Yazstremski in 1967 and only 14 times since the year 1900. It is definitely something for GM to celebrate and they are doing it in a big way. Cabrera is already cashing in on his Triple Crown award. ESPN reports that he gets money from commemorative Triple Crown shirts, coins and photos and, on Friday night, he'll sign baseballs and inscribe them with the words "Triple Crown 2012." Its reported that the Triple Crown winner has signed a deal with Detroit City Sports, an autograph memorabilia firm. Cabrera signed baseballs with a Triple Crown inscription will start at an introductory price of $275, but could cost in the range of $350 to $400 by Monday. It seems like everyone is cashing in on Cabrera’s success and GM is getting in on some of the action with their new sign.